A previous article has shown the importance of the gypsum being studied in the Hanksville area by the Mars 160 crew to both astrobiology and astrogeology, both to the area as a Mars analogue and for application to Mars, which is the whole purpose of Mars analogue research. The presence of gypsum and other poly-hydrated (meaning they contain more than one water molecule) sulphate minerals are also important to in situ resource utilisation (ISRU) in support of Mars expeditions, stations and, perhaps, eventual settlements. Gypsum is a hydrated mineral, which means that it contains water molecules within its crystal structure. This is why its formula is CaS04.2H20, in contrast to anhydrite, which is CaS04. Heating gypsum drives off the water at comparatively low temperatures, forming first hemihydrite (CaS04.H20) and then anhydrite, yielding up to 14% of the initial mass as water. One tonne of pure gypsum can give up to 14 kg of water, or 140 litres. This is a very useful amount of water, since the crew of a Mars expedition – and the crew of the Mars 160 mission – will use about 25 L of water per person per day without recycling. Thus this amount of water will sustain five people for a day with some left over. 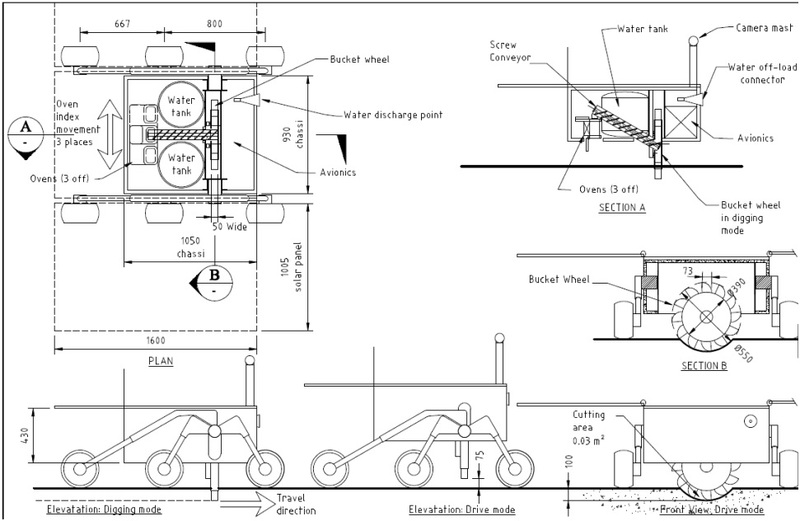 The International Space Station recycles about 90% of the water used, this technology would allow the 140 L to support fifty people per day, five people or ten days, or reduce the amount of gypsum mined per day required to 100 kg for a five person crew. 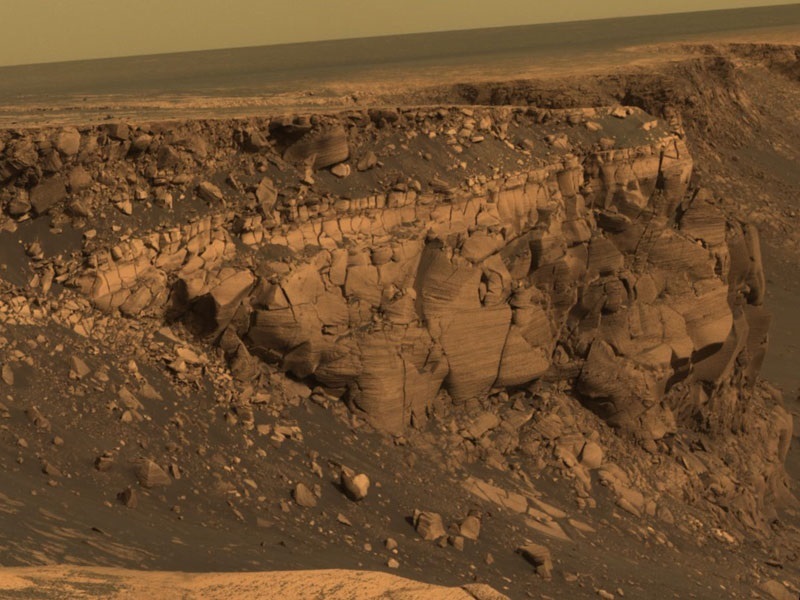 Large areas of Mars contain several percent in the topmost layers and more is probably present in the shallow subsurface. Furthermore there are many other poly-hydrated sulphate minerals on Mars, such as kieserite (MgSO4.H2O), bloedite (Na2Mg(SO4)2.4H2O), hexahydrite (Mg(SO4).6H2O), melantarite (FeSO4.7H2O), epsomite (MgSO4.7H2O), and meridianite (MgSO4.11H2O) On heating these yield 14-62% of their mass as water. Such minerals comprise 10-35% of the sediments that make up the Meridiani plains where the Opportunity rover landed in 2004. 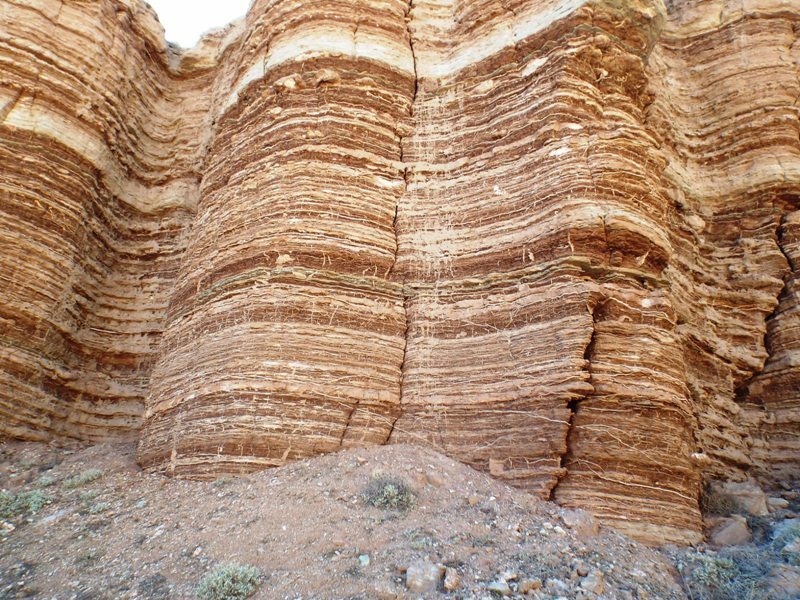 Hence the soft, fractured, and thus easily excavated sediments of Meridiani contain between sediments are composed of between 5% and 20% water. These minerals mostly dehydrate at temperatures between 100 and 325oC. 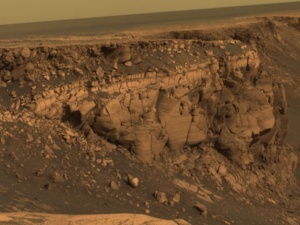 Excavation of a few tens of cubic metres of these sediments can therefore potentially supply all the water needs of a Mars mission, including that needed for propellant production. Not only do poly-hydrated sulphate minerals provide an alternative to ice as a possible resource on Mars, they may be superior. Heating of the sulphates produces distilled water whereas melted ice may contain a range of contaminants – salts, dust, and perhaps biological contaminants. The magnesium sulphates minerals were precipitated at such high salinities and are of such age it is unlikely they contain viable microbes. A recent NASA study showed that poly-hydrated sulphates such as gypsum are more efficiently mined and processed for water than ice. 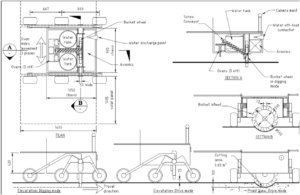 Water mined by autonomous mobile mining equipment excavating 2 tonnes (2 cubic metres) or less of poly-hydrated sulphate sediment per sol could harvest all the water needed for an initial Mars mission before the crew leaves Earth. Partially dehydrated gypsum (hemihydrite) is Plaster of Paris, a useful material for a wide range of construction purposes when re-mixed with water. Mixed with cellulose fbries it forms plasterboard, suitable for interior walls. It can be used as a mortar for bricks, for casting of simple ojects, or as a stand –alone structural material. Stockpiles of hemihydrite from water extraction plants can be recycled as construction materials once a surplus of water is available. Gypsum is going to be a mineral of great interest in our martian future. 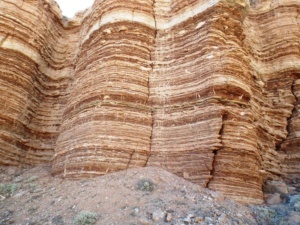 Gypsum is abundant at MDRS as veins and as bedded deposits. Water extraction experiments from these deposits might be a future research program in the area. Only through field trials can the efficiencies of using real resource materials be estimated and the requirements for Mars established.